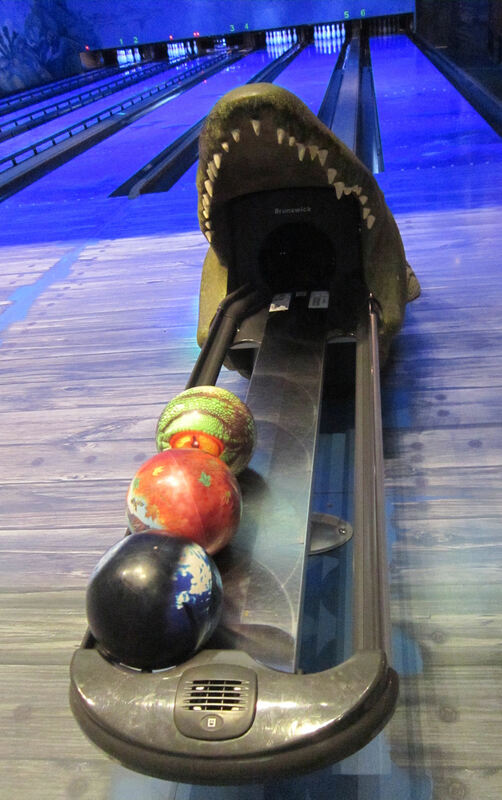 The Springs in Fall — 2015 Photos #17: Bowling for Fish « Midlife Crisis Crossover! After our tour of the Air Force Academy we declared suppertime. On the other side of I-25 we found a place in Colorado Springs where seafood meets sports, tenpins meet pin bones, and you can bring your own ball but not your own bait. 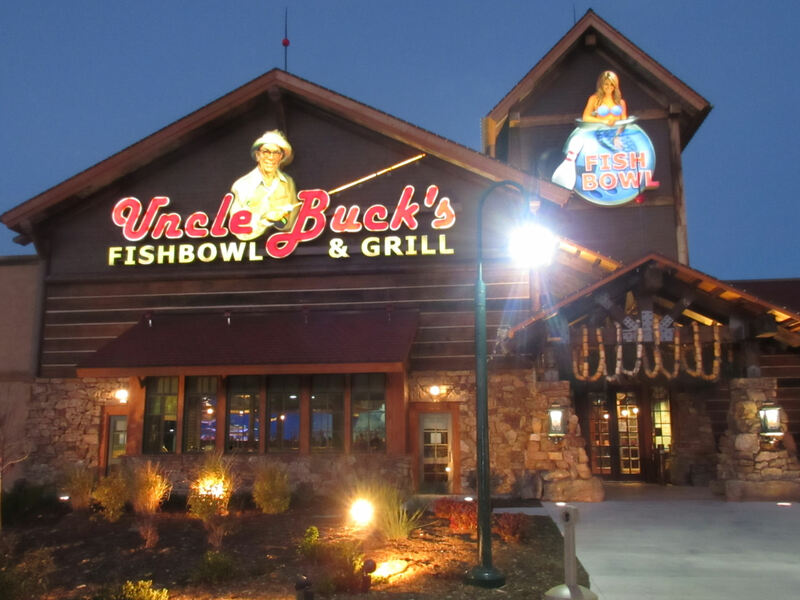 Welcome to Uncle Buck’s FishBowl & Grill. Back home in Indiana, as of this writing the great and powerful Bass Pro Shops have only opened two stores, both at opposite ends of the state, each over a hundred miles away from us. I’m okay with this because hunting and fishing aren’t my thing despite a few half-hearted attempts at each. I’ve never had an animal-stalking experience that ended in an affirming male victory. But I know stores like these do have their fans, especially for taxidermy lovers. 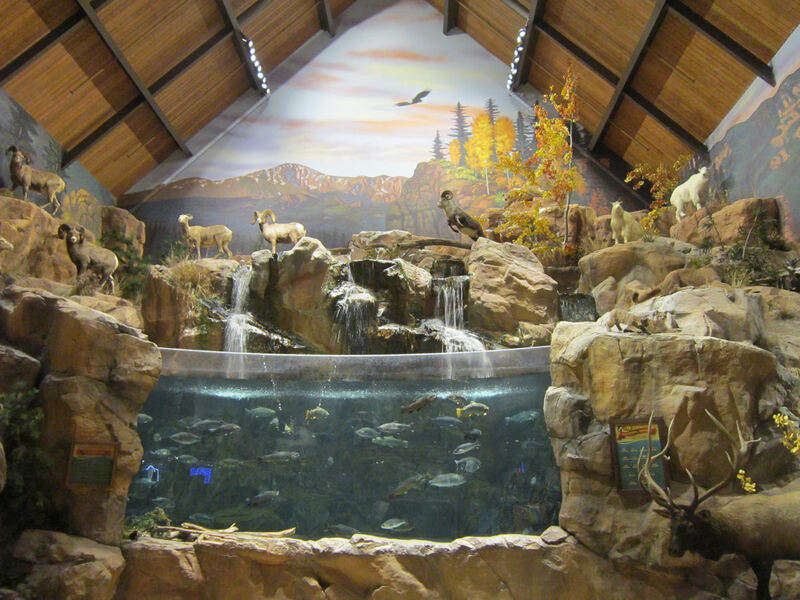 We saw a similar setup at a Cabela’s in Minnesota on our 2006 road trip, but the Bass Pro Shop in Colorado Springs is certainly competitive in that field. Schools of live fish pace back and forth under the watchful eyes of herds of faux-frolicking not-live rams and such. 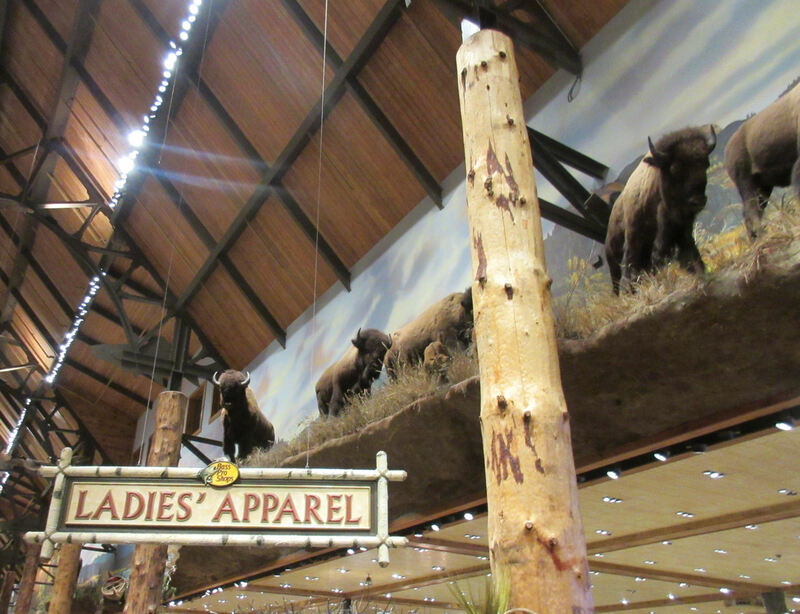 Wave hi to the bison while you’re browsing for new blouses. It’s okay, any weird overhead leering is only in your imagination. The management of this location went one step above and beyond the normal hunter/fisher paradigm and added a themed restaurant with no direct relation to the old John Candy movie. The original, eponymous Uncle Buck was the founder’s actual uncle. We weren’t introduced to his young blond lady friend over there. Uncle Buck, bringin’ em back alive. I think. If not, nobody tell me. 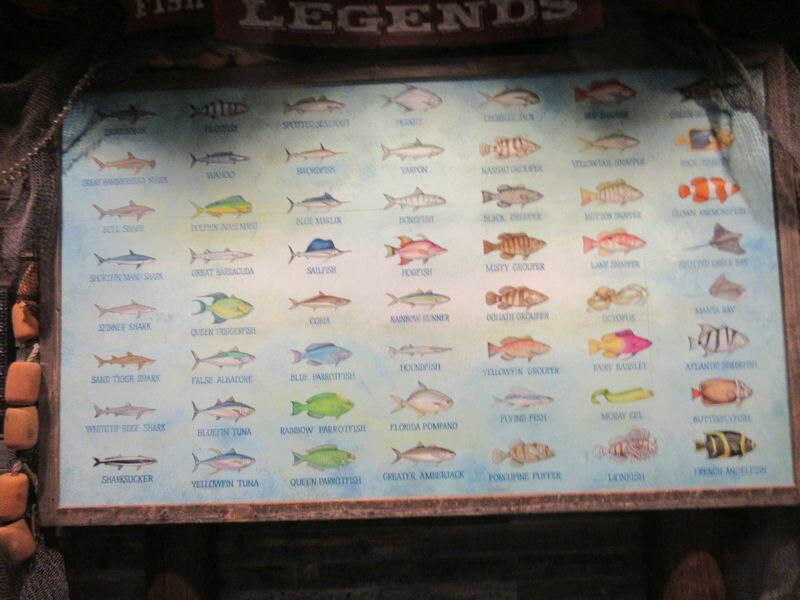 On the way in, hungry diners can consult this handy wall chart of Fish Not Appearing in This Restaurant. 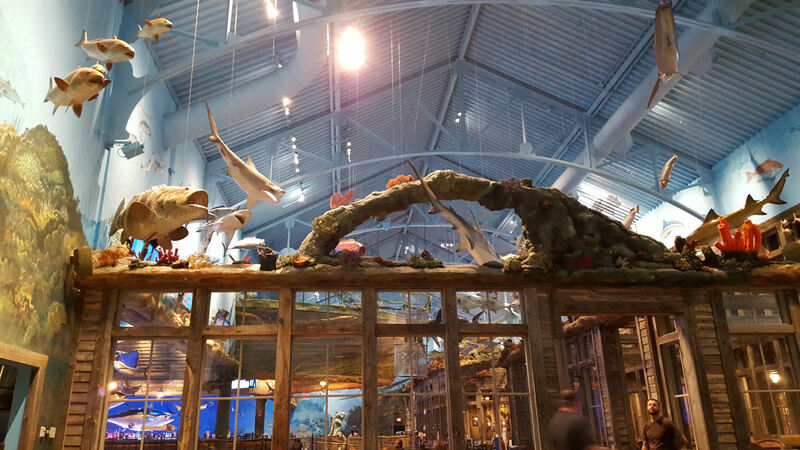 The decorating scheme simulates a stereotypical ocean floor, with its deep blue walls, sunken ship hull, and fish lollygagging all over the place. The view from our seats. I’ll give them this: their hanging knickknack collection is more unified than the average TGIFriday’s haphazard Goodwill-remainder chic. 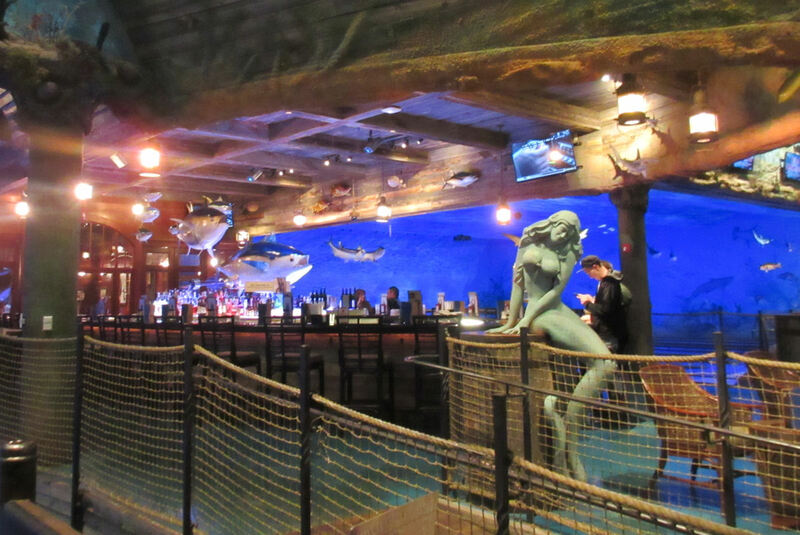 Full service bar lets wannabe pirates and oceanographers pretend they’re getting sloshed down in Davy Jones’ locker. As the name threatens, their menu is mostly fish. We’d already had seafood for dinner the night before, and for 80% of our meals on our Southern road trip in July, but we were here more for the ambiance than anything else. What we’d read about it gave us that “gotta see it for ourselves” suspicion that leads us into a lot of memorable experiences and the occasional disaster. 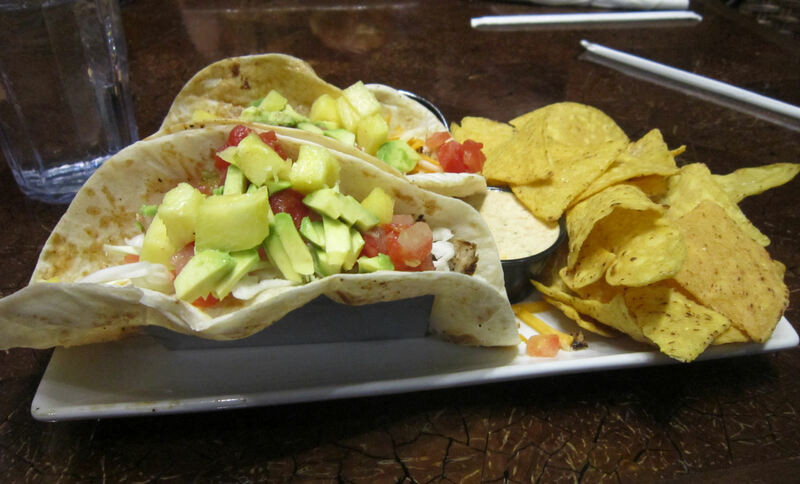 The actual food, then: Anne’s fish tacos won the night — a simple repast of whitefish, pineapple-avocado slaw, and assorted cheese. She opted out of the sauces. Her meal, her call. If only. 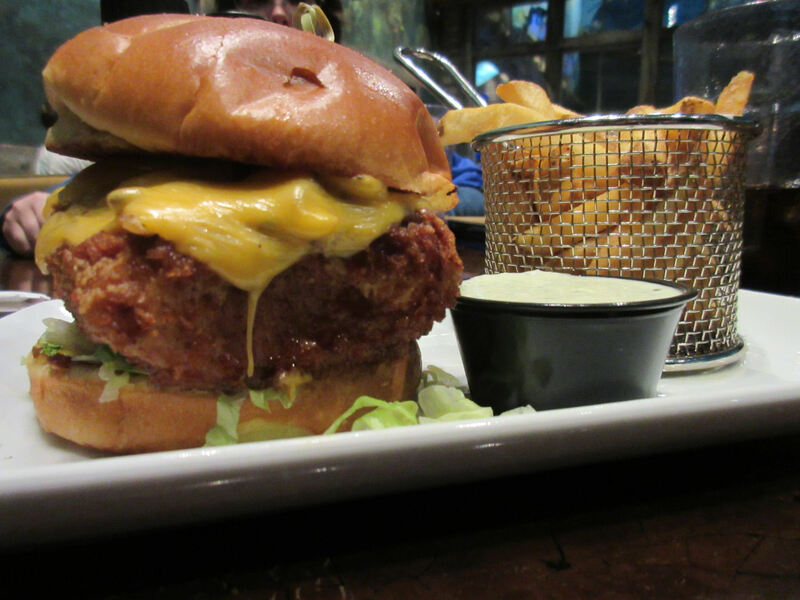 Wanna know what a sixteen-dollar fish sandwich looks like? Served with tartar sauce and American cheese? Here ya go, kid. I’d love to report on its delicate bouquet and its unique flavor profiles and its celebration of the culinary features unique to the mahi mahi. Cold reality: it’s an overpriced fish sandwich. I thought back to the glories of New Orleans and wept inside. Too bad you can’t use inside tears as a sandwich topping, because this definitely needed seasoning. I’d wager the Venn diagram of “gourmands who can discern mahi mahi from other fish” and “people who approve of American cheese on fish” has a super-small intersection. 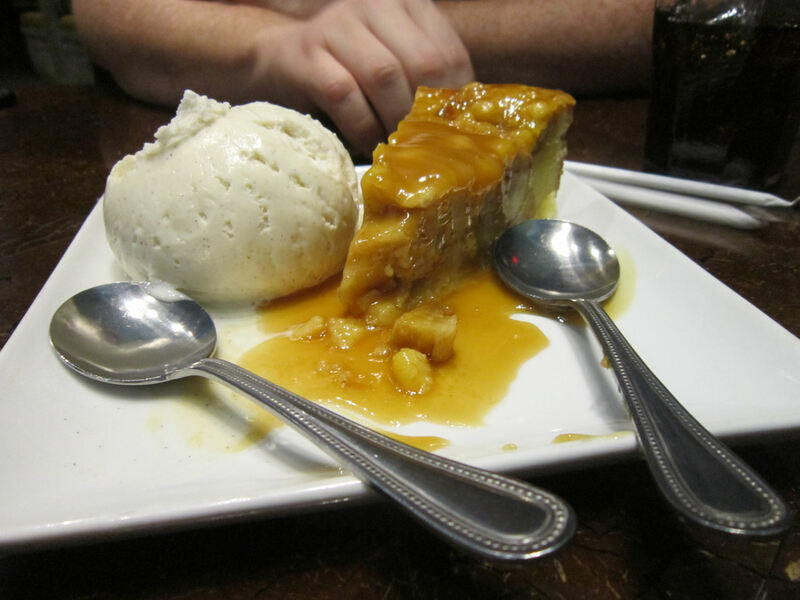 Anne had enough left of her business per diem for a wrap-up treat of caramel apple pie and ice cream. I approved. Thankfully not fish-themed. Oh, how thankfully. 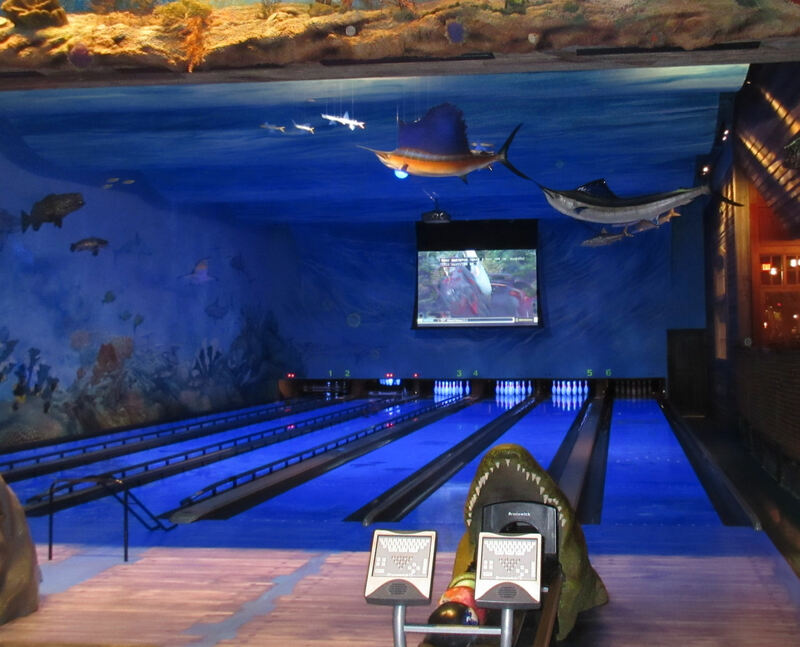 When you’re done eating, or instead of eating, you can enjoy Uncle Buck’s other specialty: fish-themed bowling! It’s funny because their name has “fishbowl” in it and there’s fish and you can bowl! 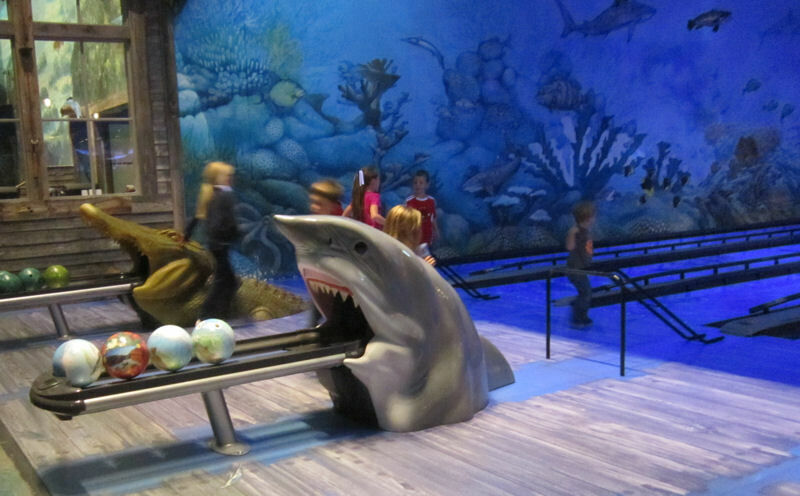 This alley dressed like an aquarium offers bowling exactly the way SpongeBob SquarePants would want it, except it’s not filled up with inconvenient drowning water. Under the sea! Under the sea! 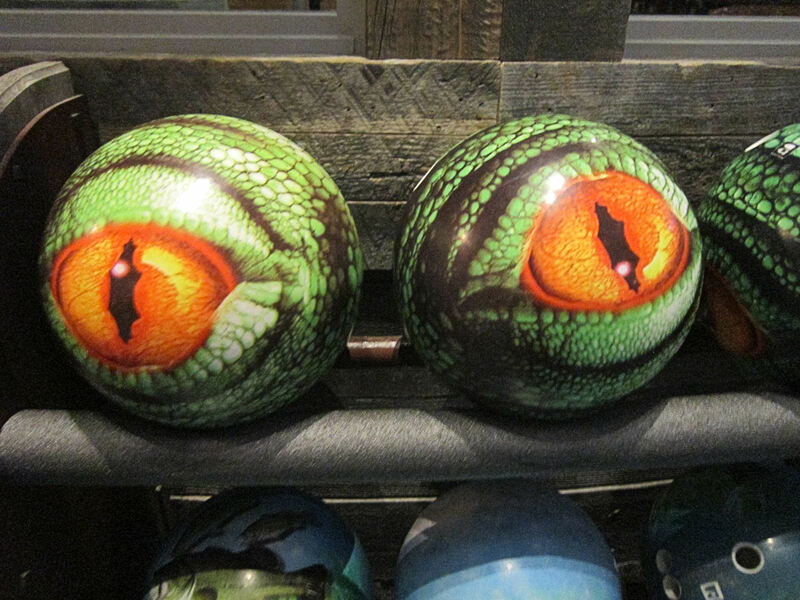 / When you go bowling, balls are still rolling / Magically! Out on the lanes, go get a strike! / Then have a lunch of deep-fried pike! 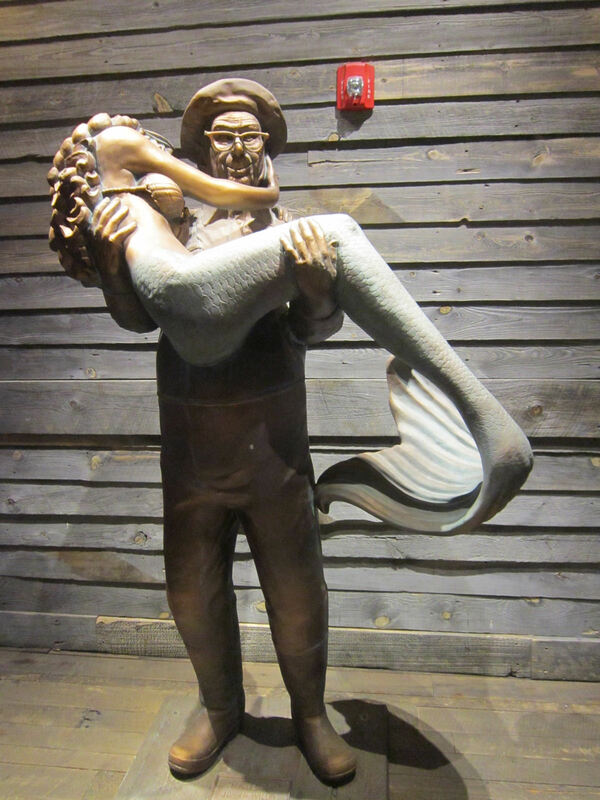 Our balls are heavy / And there’s no levee / Under the sea! …but we skipped the bowling part. Anne hasn’t bowled in over two decades, and I’ve bowled exactly three times in my life, which came as quite a shock some years ago to the coworkers who once enlisted me in a bowling tournament under the sexist assumption that all fat guys are awesome bowlers. I don’t think my top score of 90 impressed them much. And that was with lovable internet friends giving me last-minute tips beforehand. Should’ve been a lot worse. So no, no bowling for us.